By Western blot, this antibody detects an ~55 kDa protein representing ER beta from Rat brain homogenate. Immunocytochemical staining of ER beta in cells overexpressing the Human protein results in nuclear staining. Synthetic peptide corresponding to Rat Estrogen Receptor beta aa 467-485. Our Abpromise guarantee covers the use of ab3576 in the following tested applications. IHC-P 1/50. Perform heat mediated antigen retrieval via the microwave method before commencing with IHC staining protocol. WB Use a concentration of 1 µg/ml. Detects a band of approximately 55 kDa (predicted molecular weight: 59 kDa).Can be blocked with Estrogen Receptor beta peptide (ab5018). Nuclear hormone receptor. Binds estrogens with an affinity similar to that of ESR1, and activates expression of reporter genes containing estrogen response elements (ERE) in an estrogen-dependent manner. Isoform beta-cx lacks ligand binding ability and has no or only very low ere binding activity resulting in the loss of ligand-dependent transactivation ability. DNA-binding by ESR1 and ESR2 is rapidly lost at 37 degrees Celsius in the absence of ligand while in the presence of 17 beta-estradiol and 4-hydroxy-tamoxifen loss in DNA-binding at elevated temperature is more gradual. Isoform beta-1 is expressed in testis and ovary, and at a lower level in heart, brain, placenta, liver, skeletal muscle, spleen, thymus, prostate, colon, bone marrow, mammary gland and uterus. Also found in uterine bone, breast, and ovarian tumor cell lines, but not in colon and liver tumors. Isoform beta-2 is expressed in spleen, thymus, testis and ovary and at a lower level in skeletal muscle, prostate, colon, small intestine, leukocytes, bone marrow, mammary gland and uterus. Isoform beta-3 is found in testis. Isoform beta-4 is expressed in testis, and at a lower level in spleen, thymus, ovary, mammary gland and uterus. Isoform beta-5 is expressed in testis, placenta, skeletal muscle, spleen and leukocytes, and at a lower level in heart, lung, liver, kidney, pancreas, thymus, prostate, colon, small intestine, bone marrow, mammary gland and uterus. Not expressed in brain. Composed of three domains: a modulating N-terminal domain, a DNA-binding domain and a C-terminal ligand-binding domain. Immunohistochemistry (Frozen sections) - Anti-Estrogen Receptor beta antibody (ab3576)Image from Novensà L et al., PLoS One. 2011;6(9):e25335. Epub 2011 Sep 22. Fig 4.; doi:10.1371/journal.pone.0025335; PLoS ONE 6(9): e25335. Immunofluorescence analysis of frozen murine thoracic aorta, staining Estrogen Receptor beta with ab3576 at 1/50 dilution (green: not merged with nucleus, or purple: merged with nucleus). Nuclei were stained with DAPI (blue) and actin fibers were stained red. Immunofluorescent analysis using Estrogen Receptor beta polyclonal antibody (ab3576) shows nuclear localization of Estrogen Receptor beta in MCF7 cells. Formalin fixed cells were permeabilized with 0.1% Triton X-100 in TBS for 10 minutes at room temperature. Cells were blocked with 1% BSA for 15 minutes at room temperature. Cells were probed with a rabbit polyclonal antibody recognizing Estrogen Receptor beta (ab3576), at a dilution of 1:100 for 1 hour at room temperature. Cells were washed with PBS and incubated with DyLight 488 goat-anti-rabbit IgG secondary antibody at a dilution of 1:400 for 30 minutes at room temperature. Nuclei (blue) were stained with Hoechst 33342 dye. Images were taken at 20X magnification. This image is courtesy of an Abreview submitted on 3 February 2006. 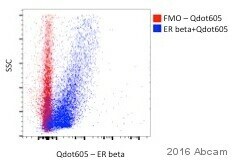 Immunolocalization of ER beta from CHO cells overexpressing the Human protein, using ab3576 (1ug/ml). Publishing research using ab3576? Please let us know so that we can cite the reference in this datasheet. Inquiry: Please specify which antigen retrieval buffer is recommended to use with ab3576? Thank you. Thank you for your enquiry and interest in our products. I can confirm that ab3576: Anti-Estrogen Receptor beta has been used in different dilutions in IHC (P). A) Paraffin-embedded sections were dewaxed and rehydrated through graded alcohol. Heat-mediated antigen retrieval was performed at 100 C in 1 liter 0.01 M citrate buffer (pH 6.0). Concentration of antibody used: 5 µg/ml. B) After washing, the sections were transferred to plastic jars containing 0.01 M citrate buffer (pH 6.0) and boiled in a microwave oven for 10 min at 700 W. Samples were allowed to cool for 20 min before washing in PBS. 1:500 dilution in PBS + 2% BSA. Thank you for your participation in Abcam's post complaint survey. Please let me know if there is anything else I can do for you, or if you have questions to any of our products (e.g. primary antibodies, lysates, secondary antibodies, kits, controls, gels, proteins/peptides, slides, biochemicals, conjugation kits). The details you have kindly provided will enable us to investigate this case for you and this is also helpful in our records for monitoring of quality. I would like to reassure you that ab3576 is tested and covered by our 6 month guarantee for use in WB and human, mouse and rat samples. In the event that a product is not functioning in the applications cited on the product data sheet, we will be pleased to provide a credit note or free of charge replacement. Reviewing this case, I would like to offer some suggestions to help optimise the results from ab3576. 1.) Antibodies will produce high background if they are used too concentrated. I suggest to further dilute the antibody. 2.) background is often generated by the secondary antibody and therefore I can recommend to rum a "no primary" control. 3.) Cell lines often produce artifact due to prolonged culturing. We have reports from customers using this antibody in tissue samples with good results. I suggest to run a positive control with a suitable tissue lysate. 4.) Since Estrogen Receptor beta is a nuclear protein, I can suggest to prepare nuclear lysates to clean up the blot. 1.) What lysis buffer was used? 2.) There are 8 isoforms of this protein. They range from 35kDa to 59kDa. Do you which one are expressed in the cell lines used? I hope this information is helpful, thank you for your cooperation. Should the suggestions not improve the results, please do not hesitate to contact me again with the further requested details. I believe I would like to wait for the ab3576 to become available. If it is not available by the end of August, then I would like to try the ab5784 antibody. Thanks so much for you help. Thank you very much for you reply. I'm sending a free of charge vial of ab3576 on the order ***, which we expect to arrive around August 24. Your purchasing agent will receive an email update if there are further delays to expect. Please keep me updated about the results with this new antibody, and let me know if there is anything else that we can do for you. I look forward to hearing from you. No bands in WB and no signal in ICC/IF using rat Beta cells overexpressing human ERbeta. Thank you again for your call yesterday and for letting us know about the trouble with ab3577. I've checked with our supply chain and we do expect to have ab3576 back in stock by mid-late August, tentatively August 21. Would this work for you? I look forward to hearing from you. Please let me know if you have any further questions or if there is anything else that I can do for you. Thank you very much for your call today and for letting us know about the trouble with ab3577. As we discussed, I will be happy to send a free of charge replacement antibody since this one did not work. I'm checking with our supply chain regarding the availability of ab3576, and I will get back to you as soon as I have more information. The other antibodies that we discussed are ab78946 and ab5784, which have not been tested in all of the species and applications that you need the antibody for, but theyseem to bethe best candidates that we have in stock at this time. Please let me know if you have any questions or if there is anything else that we can do in the meantime. Could you suggest what we could do? Would it be possible to try the ab3577? Thank you for your reply. I am sorry that ab3576 was also producing high background. I have arranged to send you ab3577 as a replacement and am also sending a positive control mouse brain nuclear lysate, which may help to clarify your results. The replacements will ship on order ***. I hope this helps, please let me know if you need any additional assistance. Thank you for the prompt reply. Could you please remove some phrases from the mailing information? My colleague is out of the office today but I am happy to assist you. I have alerted our shipping department to remove these two phrases from your shipping label. Please let me know if there is anything else that we can do for you. other blocking solution does not help either. ab3576 or ab3577. Do you think we could try that? I am sorry that ab16813 is still producing multiple bands in WB. I would be happy to send you ab3576 or ab3577 as a free of charge replacement, as we had previously discussed. Please let me know your original order or PO number and which antibody you would like to receive, and I will be happy to assist you further.